A little over a year ago, I told you that Starbucks was testing syrup extracts for your beverage rather than the current bottled syrups. My original article featured a small test in Portland, Oregon – Starbucks tests syrup extracts. 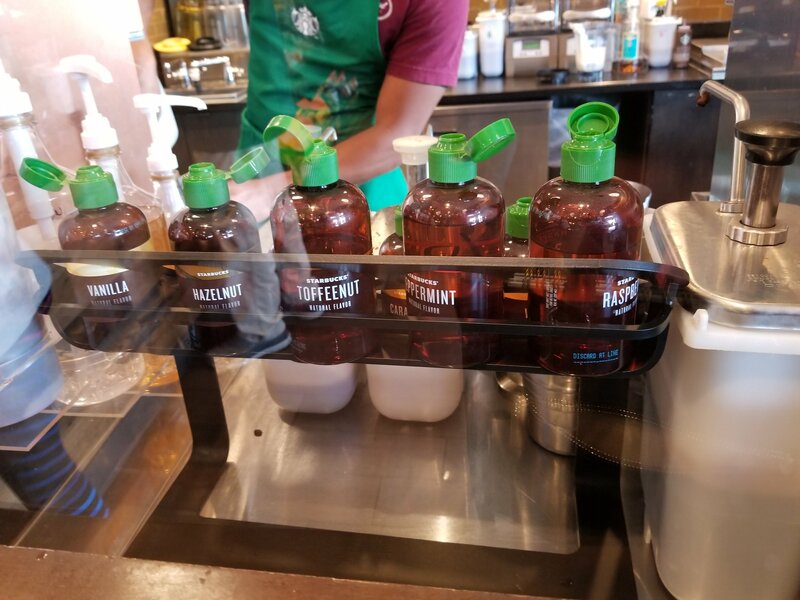 I dropped by a Starbucks in Carlsbad, California on Friday May 18, 2018 and ordered an iced toffee nut latte with the new syrup extracts. It had been a long while since I’d tried them – I hadn’t tried the new syrup extract since the original March 2017 article. 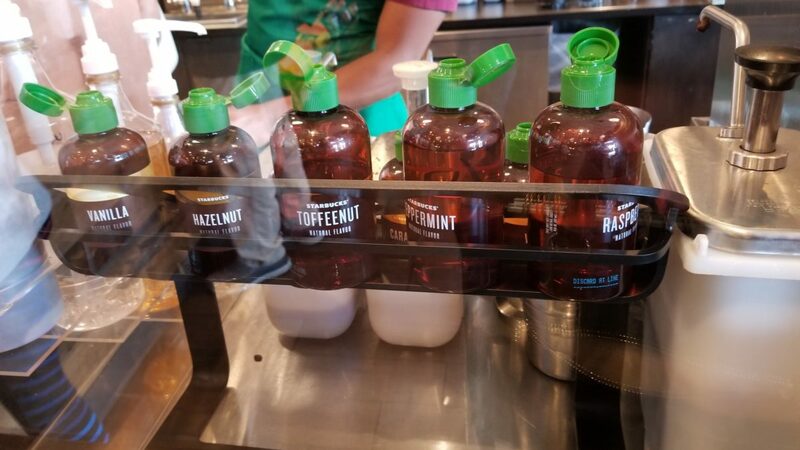 As a refresher, if a Starbucks store is using the syrup extracts, then there’s no premade syrup with both flavor and sugar, rather you can order a flavor extract and have the barista add as much or as little simple syrup separately. The syrup extracts come in small bottles with green lids, and the barista shakes some of the extract into your drink. I decided to order my drink twice: I ordered one iced toffee nut latte with extract and cane sugar, and a second one with extract but with no cane sugar, comparing and contrasting the two drinks. The register barista gave me a pre-warning that she didn’t think the toffee nut worked so well without sugar at all, and recommended that I add just a few pumps of cane sugar. A grande iced toffee nut latte would come with some shakes of the syrup extract plus 4 pumps of cane sugar, for the standard recipe. Despite the warning that a little sugar was recommended, I ordered one drink as the standard and the other completely without sugar. It’s true, the one without sugar really lacked in flavor. Maybe toffee nut in particular needs a little simple syrup. What does all this mean? Well it cuts both ways. If this really launches nationally, it will be a major overhaul of almost every single beverage of Starbucks. Of course, black coffee drinks, and plain lattes and such without any sweetening flavor won’t be affected. But for many customers, they may notice their drink flavor has changed, and might have to readjust how they order their beverage. Indeed, some will need extra simple syrup, and some less. In any case, it will be a big adjustment. Some customers who really want the option of a low sugar drink will be happy to be able to control how much simple syrup goes into their beverage. However, it sure seems like Americans are addicted to sweet beverages. I see this change causing a little chaos and disruption before it ends up being accepted by the typical Starbucks customer. It’s a bold move by Starbucks, if this is indeed coming nationally. EDIT on 5-27-18: Indeed, I have confused “Simple Syrup” with “Cane Sugar Syrup” – They are used interchangeably in this article. However, the Starbucks iced teas are standard with the Cane Sugar Syrup. Other beverages, like the beverages I tried in this story, as well as all other non-tea drinks, are served with the Simple Syrup. My apologies for the confusion. Use your Starbucks birthday reward on your birthday: One day only (Used to be 4 days). Starbucks thinks you might like whole bean coffee in big plastic jars. Love this – gotta get back to St. Louis to try these. I really really hope this happens. I’ve been asking for years for “flavors without sweet” and almost always get a response of “we have sugar-free”. Um, have they tried the sugar-free? They are painfully sweet. A grande iced toffee nut latte would come 4 dashes of toffee nut & 4 pumps of simple syrup. The liquid cane sugar is for iced teas. I am in the Greater St. Louis Flavor Reinvention market, and we have had extracts since last summer. We recently rolled out SF Simple Syrup as well, and can now do all flavors besides mocha, white mocha, and chai as sugar free. There’s actually been very few customer issues, although interestingly the negative feedback had been overwhelmingly in regards to toffee nut. We definitely had an action item approximately 6 weeks ago that included the info that Flavor Reinvention was rolling out nationwide by FY19 Q2. What ingredients are in the sugar free simple syrup? I emailed Starbucks and they answered my email but didn’t answer my question. I like the idea, but after trying the new formula for toffee nut twice, I have to admit that I threw it away both times and have never again and will never again return to Starbucks for a sweetened beverage. Really missed the mark for me. I hate this idea..several stores in my area have changed to this and it has totally ruined my vanilla iced latte. Why mess with a good thing?? If they all change to this then unfortunately starbucks will no longer be my coffee stop. Franchise stores [ex Target or Randall’s] say they’re not making the switch. I love the idea, but absolutely HATE the flavor of the extracts. I’ve tried them in iced salted caramel mochas (using 5 pumps regular mocha, one “dash” toffee nut so there is sugar in the drink) and iced peppermint mochas (same except for peppermint instead of toffee nut), and both tasted off with the toffee nut being horrific, it had a marshmallowy taste to it and both left a funny feeling on the back of my tongue like artificial sweetener does. Plus, the “dashes” are horribly inconsistent. I really want the option of having flavors with less sugar, but I am completely dismayed at how awful their taste testers did with getting the flavors right. To make matters worse, I kept having the store remake my salted caramel mocha because it tasted off and nobody mentioned the extracts until I went up to the counter! There was zero advertising, so how are people supposed to even know they can get less sugar in their drinks??? IF this rolls out nationwide, I will be stuck with only ever ordering iced mochas and maybe teas–no holiday beverages at all. For such a huge company bent on consistency, this is a huge failure. I’ve already bought a few real syrups online and am making more iced espresso drinks than ever before (yay aeropress!). I don’t normally like the flavored lattes because they are too sweet for my taste, and I also don’t appreciate the amount of sugar that’s in there. I much prefer Nespresso’s flavored coffee capsules that have a distinct added aroma but no sweetness. So if Starbucks’ new flavor extracts are anything like that, I can’t wait to try them out!